Tonight I did something on my personal Facebook that I rarely do. I raged on Facebook. I didn’t do it because I wanted attention or for everyone to tell me that I am awesome, but it helped. I just needed to get it off my chest. Tonight something someone said about me got back to me, and it just really bothered me. I am sure part of it was my pregnancy hormones, but let’s face it, it does kinda hurt when someone you care about says awful things about you behind your back. After I calmed down with some Die Fantastichen Vier and Darko Rundek (weird combination, but two bands definitely worth a look if you are unfamiliar), I thought of the following quote below. 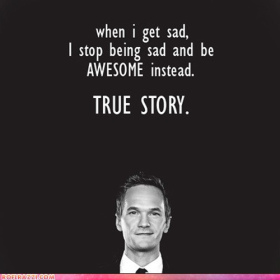 So yeah, I had to settle down and realize I am awesome. Thank you to my friends who were so kind to me tonight. What do you do to pick yourself up from a funk?